You could be working steps away from the best views of the mountains! 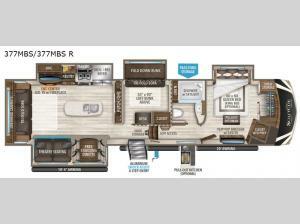 Imagine a bunkhouse including a sofa and a desk for your multi-purpose room. You will find a loft above for extra sleeping space or storage, a full bathroom and a master bedroom with everything you need! The kitchen includes a professional grade stainless steel cooktop, built-in oven, convection microwave, and a stainless steel 18 cu. ft. residential refrigerator, plus a large pantry. You will also love the center island and hutch for additional space for your things. You will certainly enjoy the fireplace, theatre seating, and any option you choose to make your life better on the open road!